Here are a few quick facts about the game of roulette that you may not have known before. Roulette is the third most popular game found in the casino. Slots and craps are the only two games that are more popular amongst players. 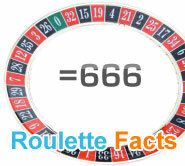 All of the numbers on a roulette wheel add up to 666. Hence why roulette is referred to as “the devils game”. The game of roulette gets its name from the French word for 'small wheel'. There are no betting systems that will allow you to consistently win money from roulette. Albert Einstein once said that "You cannot beat a roulette table unless you steal money from it." European roulette offers far better odds to the player than American roulette does. This is because American roulette has the extra '00' number, yet still gives the same payout odds. The five number bet on '00', '0', '1', '2' and '3' on the American roulette table offers the worst odds of any roulette bet, giving a 7.89% edge to the house. As far as house edges go, the game of roulette sits between the 3.5% house edge of let it ride and the 2.3% house edge of three card poker. European roulette has a house edge of 2.7%. A man from England named Ashley Revell sold everything he owned and went to Vegas to gamble it all on one spin of the roulette wheel. He won with a bet on red, and won $135,300.